La Brise is a name of boat Leopard 44 ,which was produced in 2012. You can rent her from port Fethiye in the area of Fethyie. La Brise is equipped with 10 berths. Sleeping places on the sailing boat are arranged in 10 (8+2) scheme. 4 cabins are situated inside the sailing boat La Brise. 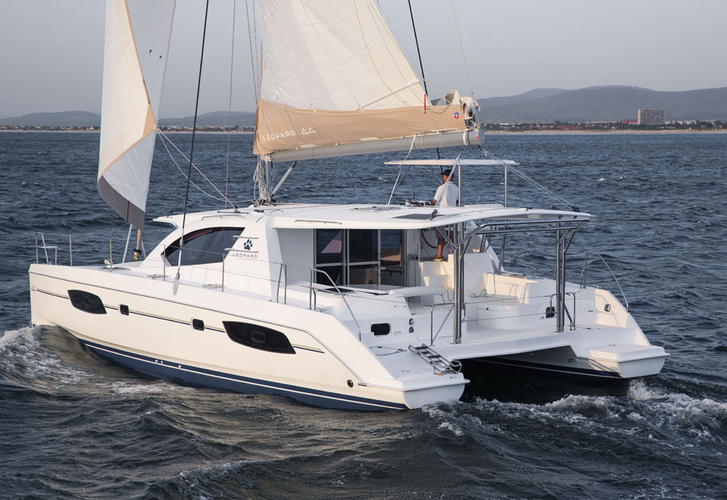 Find more search results following this link: Catamarans Fethyie. Crew members can feel satisfied on this boat , because there are 4 bathrooms for their disposal. With 700.00 l l. in fuel tank you can sail really far and still be independent because of 780.00 l l. in water container. La Brise is supplied with motor 2x 40 hp. Boat's dimensions are: lenght - 12.98 meters , width - 7.25 m and 1.20 m of depth. On the yacht there is following equipment: Plotter gps in cockpit, Autopilot, Gps plotter, Anchor electric windlass, Bimini top, Dinghy, Outboard engine, Radio / cd player, Classic mainsail, Inverter 12v-220v. . Deposit accounts for 3000.00 EUR. In our search machine you can effortlessly check avalailability of boat La Brise from Fethiye by clicking on this link: Catamarans Turkey.